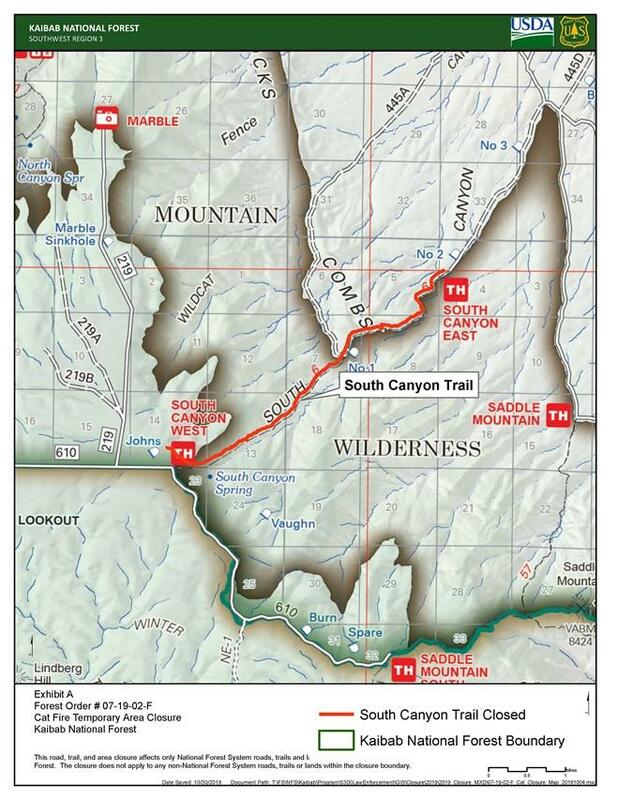 FREDONIA, Ariz. — Fire officials on the North Kaibab Ranger District of the Kaibab National Forest are extending the South Canyon Trail closure through at least spring 2019 for both public and firefighter safety. According to the InciWeb report, the Cat Fire was originally started by lightning Aug. 6. The first jumped quickly in a matter of days as a result of weather conditions at the time. Trail and road closures were put into place that were later lifted. However, when the fire kicked up again mid-September, the closures were reinstated. At the end of September, the Cat Fire was estimated to have burned a little over 4,600 acres. According to the press release from Kaibab National Forest, once it is determined safe to do so, the trail will be reopened for public use. There are no other closures in effect in the area. To contact the North Kaibab Ranger District office, call 928-643-7395. Oh dear, it’s so distressing to read about a fire. Isn’t there a story about a dog having puppies, or someone planting begonias? My neighbor just laid new driveway gravel. Let’s talk about that! Think of all the deer that are probably lost! Uh oh its gonna frost soon too. Lunchboxhero ……woooooohooooooo yeah I would love to see an article about your neighbors driveway ! ….I wouldnt want to see someone get offended by the picture of burning weeds and stuff ..LOL !